First of all a little bit on how you can get there: you have to take a ferry from Stavanger to Tau (time tables can be found on norled.no). The trip takes a maximum of 40 minutes and it costs about 170 kroner (20 USD) for a car (including the driver) and about 55 kroner (7 USD) for each person. When you get to Tau you should take route 13 towards Sandnes and then follow the brown signs leading the way to the Preikestolen parking. I think the parking costs about 200 kroner (24 USD) for a standard car (there are different prices for motorcycles, RV's and so on). 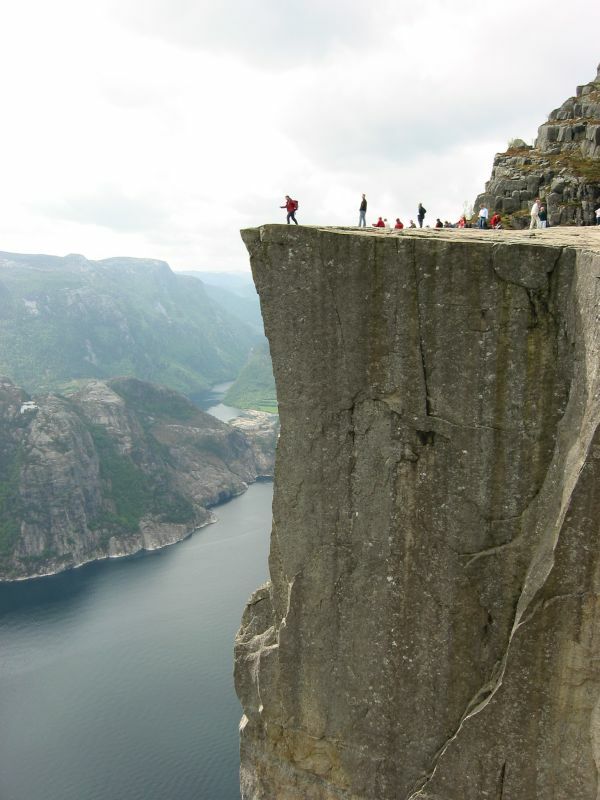 The trip from the parking to Prekestolen is not really that far. In distance it is about 3.8 kilometers (2.4 miles) but it can take about 1 hour and 30 minutes to the top. 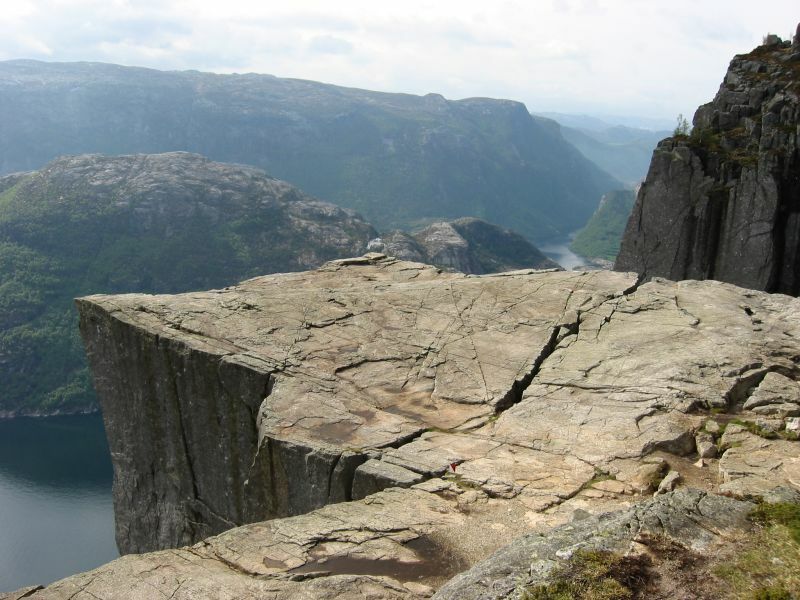 The parking is at about 270 meters above sea level and Prekestolen is at 600 meters which means that there is a 330 meters (1080 feet) height difference. 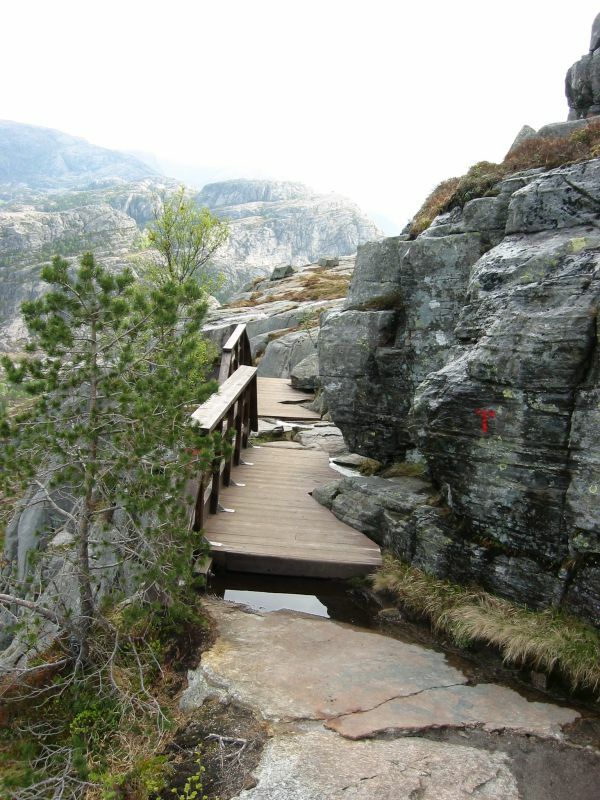 The path leading up to Preikestolen has been improved a lot since the first time I went up there but you still need a pair of good shoes (or boots). As the height difference suggest it is a bit of a climb at some places so bring some water, some snack and maybe even some dry clothes. Finding the way to the top is not a problem at all - just follow the path and if you can't see a path then you can look for the red T's :-) The path varies from gravel path, rocks and wooden paths. On the way up you will also find some benches and tables that can be used if you want to take a break and enjoy some of the food that you have brought along. 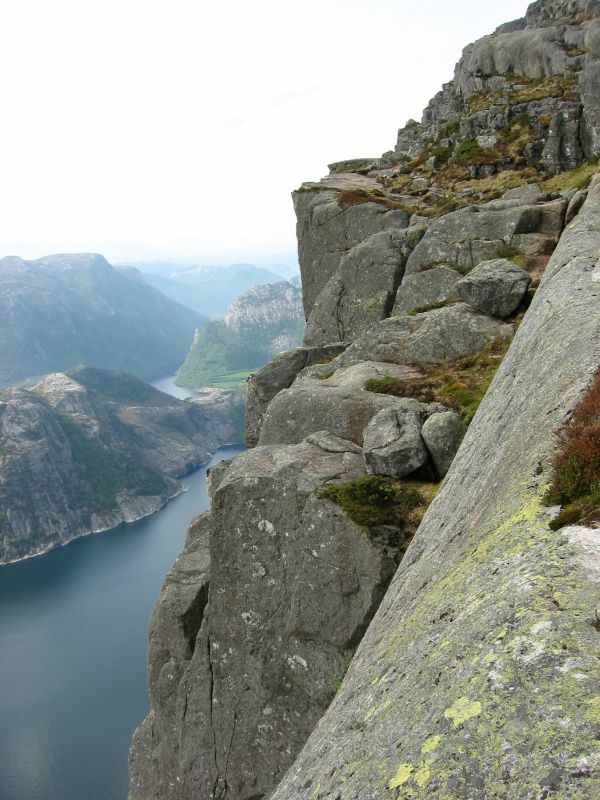 We started walking at about 8.30 and we walked alone all the way up to Preikestolen. I was quite surprised that we were alone because this is one of the major tourist attractions in the area and it can be pretty crowded in the summer time. But I guess it was a combination that it is early in the season, it was early in the morning and the weather forecast was not great. But I'm not complaining...in fact it made it into a really special experience. When we got up to the top we were more or less alone there - apart from a couple had spent the night in a tent there so we could enjoy the view and take some pictures of the place. So what is unique with this place? Well, as the name indicates (and the pictures show) this looks like a pulpit when seen from below. 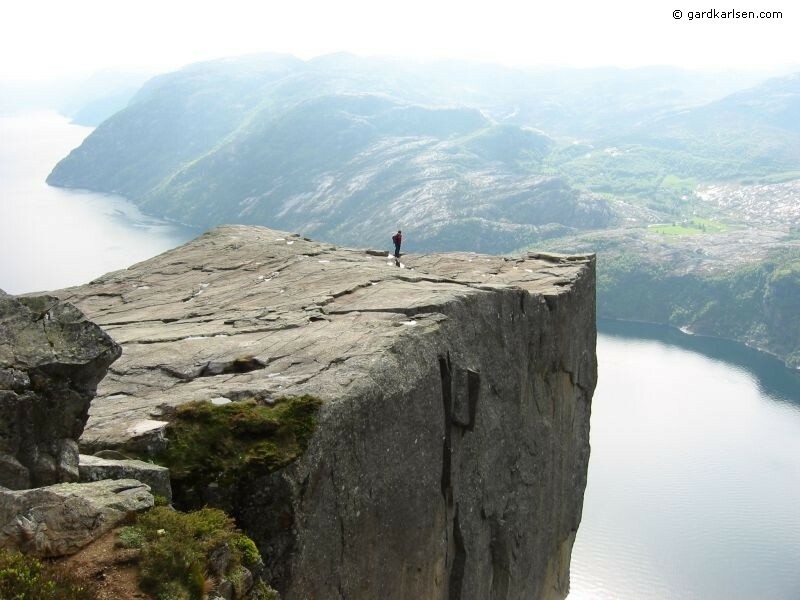 The rock itself is something like 25 by 25 meters and when you stand on the edge it is basically 600 meters (1970 feet) straight down to the Lyse fjord . And on clear days you get a great view of the Lysefjord. The path leading up to Preikestolen is also very scenic - especially the last part when you start getting the first glimpse of the Lyse fjord. On the way down we met quite a few on their way up and some had the traditional question "How much longer to Preikestolen?" :-) It is always fun serving a white lie telling them that there is still 3 hours to go just to see how people react :-) Or even telling them that there are so many people there that you have to get in line to take a picture. But we did of course set the record straight before we said goodbye to people. We met a lot of different nationalities on the way: Norwegians, Danes, Swedes, Dutchmen, Germans and so on. I guess that proves that it is truly one of the major attractions in Stavanger. 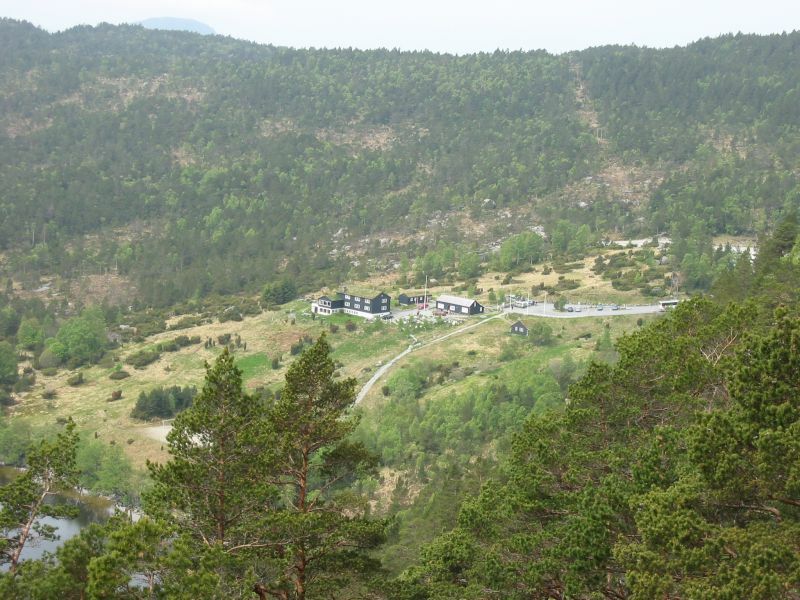 There are quite a few other trails in the area so if you like trekking it is possible to stay at the youth hostel Preikestolen fjellstue which is located near the parking lot. And if you don't want to stay there you can just stop by to get some Norwegian dishes...like komle (it is a mix between potato and flour made into balls - potato dumplings in other words :-). Well, for more information please check out their website. 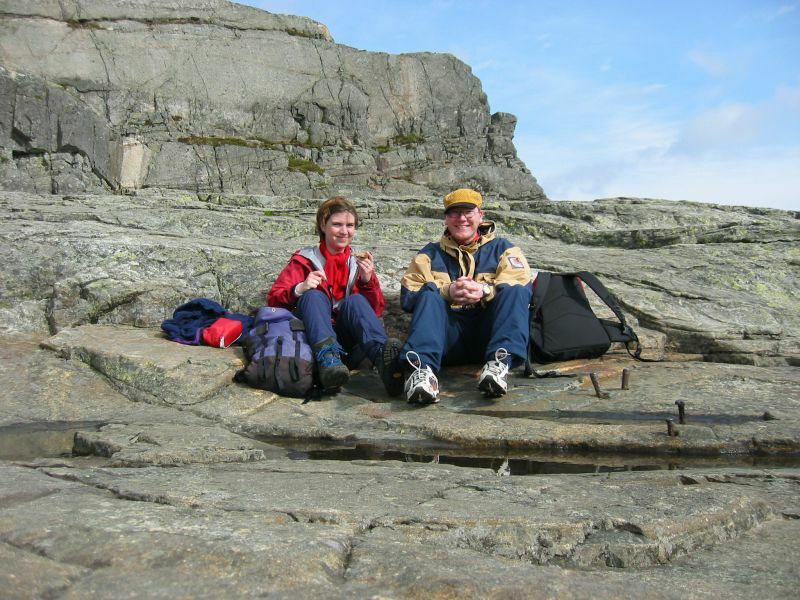 In the summer it is easy to get to Preikestolen as there is a bus service - Google it and you will find the details. But outside the main season it has been tricky for people to make it here but now there is a tour company called Outdoorlife Norway that offers tours both in the summer and wintertime - that is excellent! 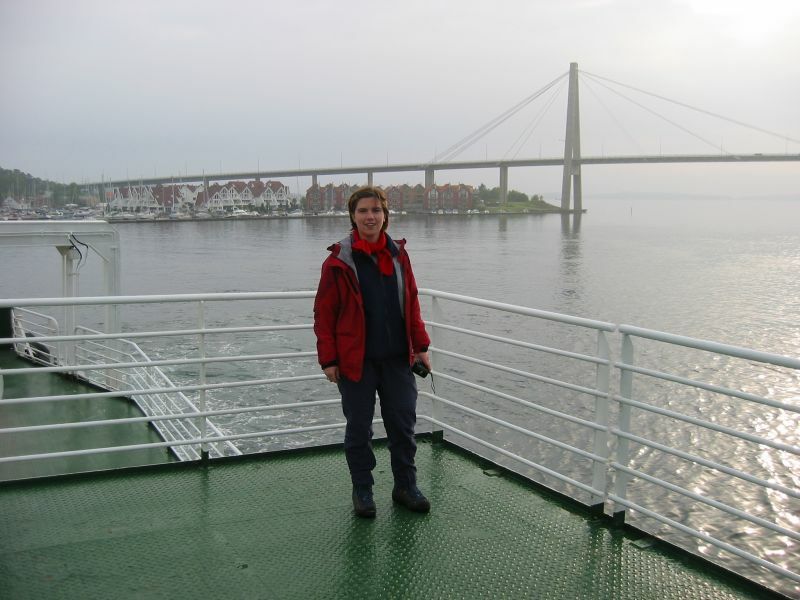 When going back to Stavanger you have the option of going back the same when as you came. It is also possible to follow route 13 to Oanes. At this place you can make a stop at Lysefjordsenteret where you can have a meal or just look at the view. From here you can take a 10 minute ferry over to Lauvik and from there you can drive back to Stavanger. We decided that it was too early to quit so we took a left turn and drove towards Oltedal. Our destination was Byrkjedal and the Byrkjedalstunet. This is a former cheese dairy but now it has been turned into a place where they make candles (kids can even try to make candles themselves) and sell souvenirs. There is also a pretty good restaurant here if you want to taste Norwegian food. From Byrkjedal it is only a short drive to Frafjord and another attraction: Månafossen. 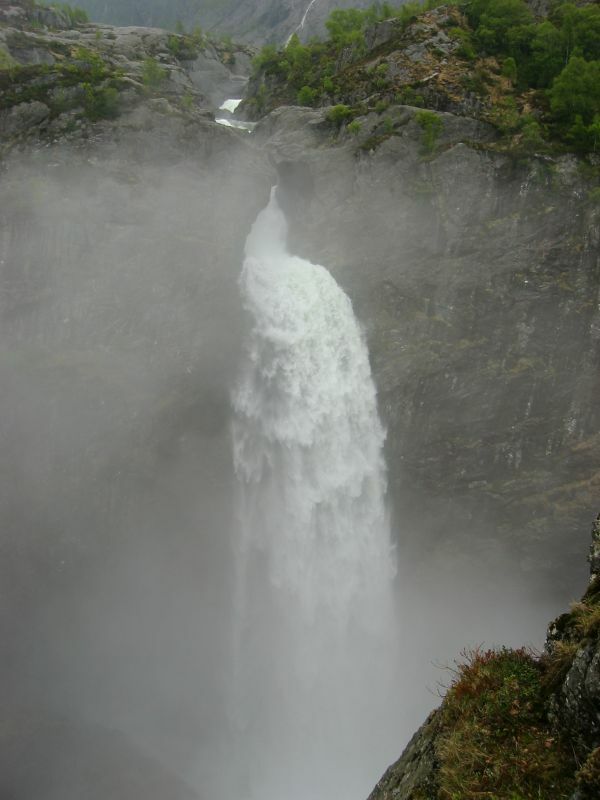 Månafossen is the highest waterfall in the Rogaland area if I'm not mistaken. It was a scenic drive there by the way. We got to signs saying "Drive carefully...the lambs are playing" and soon we saw sheep and their lambs walking around on the road. After parking (and paying 20 kroner for the parking) we walked the short walk to the lookout point to see the waterfall. Unfortunately it had started raining so it was not the best view. But it was still a very nice experience. 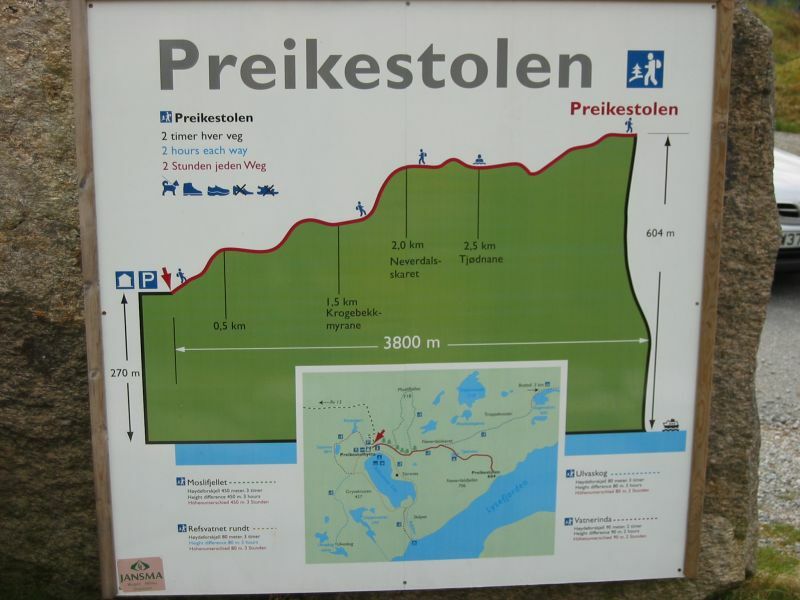 Well, I hope that this has been of some help to people that want to see Preikestolen and the surrounding area. I had great fun showing all of this to Caroline because she seemed to be very impressed with the mountains, the scenery and so on. For me this was a super nice trip :-) If you have any questions please do not hesitate to get in touch with me - you can get in touch with me on gardkarlsen@hotmail.com . Here is a video that shows a couple of scenes from the walk up to the top and from the top itself. I took this video when I walked up there in 2011.